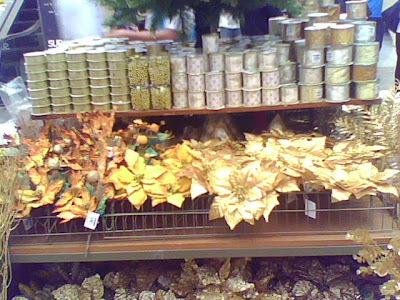 Home Christmas christmas colors christmas season christmas time gold Makati malls red santa santa claus SM Mall yuletide yuletide symbols Yuletide Symbols IV: "Gold or Red Christmas?" One week more to wait before the year's greatest celebration! Everyone of us are excited...but of course many were really, really busy! Christmas is in the air! We can feel it, we can hear different Christmas songs, and of course, we really see it! 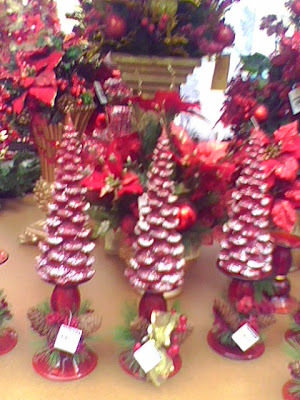 Speaking of seeing the Christmas, it is associated with the different colors! But have you asked yourself what is really the color of Christmas? Well, welcome to the fourth part of my Christmas special for this year! 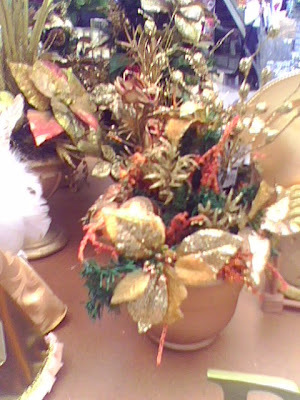 Like the previous three, here are the pictures taken from the Christmas displays in SM Mall, Makati using my digital camera mobile phone! Gold...Red...?! Which of these two colors best represents Christmas?! Gold Planted Around the Corner! Building a Golden Christmas Tree...Wow! Yup, the pictures above show how gold is associated in Christmas. 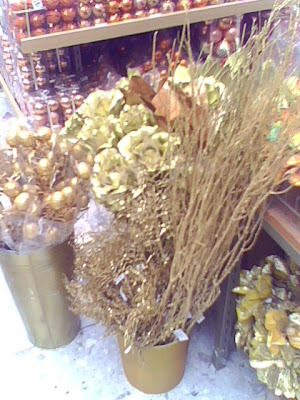 Sparkling, shinny, shivering...these how gold symbolize the season. But if there is gold, next inline with this are silver and bronze. This group represents the brightness and shinning of Christmas! But then, there is also shinny red, blue, and green next to the first three! Well, what can you say on the images above? Did gold really supports Christmas celebration?! 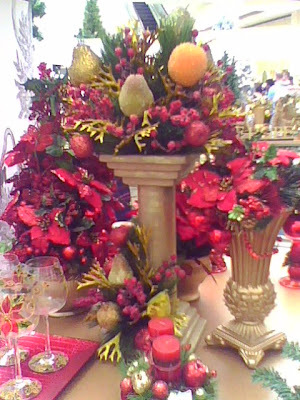 Oh What A Red Christmas Fruits! Red, Red, Red Around The Corner! And now let's go to the most popular color of Christmas...the red! Of course all of us were familiar with Santa Claus' robe. It is well-wrap with red color! Even his dwarfs, reindeers, and sleigh...red is the primary color! Try to rotate your eyes on the decors around you. 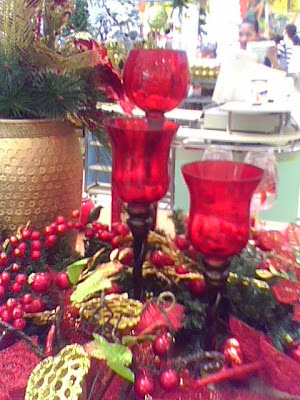 Red is all around when yuletide season comes! 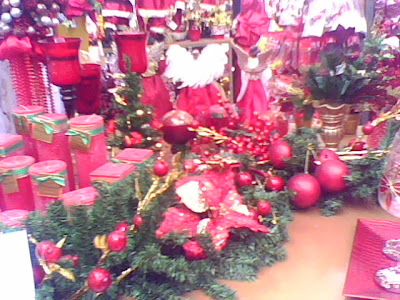 You could see red Christmas trees, red parols, a red poinsettia which is known as the flower of Christmas, red Christmas sock, red candies, etc.! 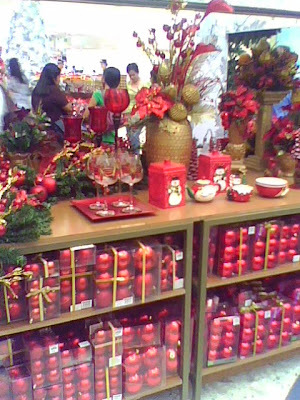 Red really dominates the yuletide season! Now if I were to ask you, which will you prefer a gold or red Christmas?! But of course I know that you are dreaming of a white Christmas just like me! Hahaha! And all of us never ever want to have a blue Christmas! I think red is better since it is more associated with green which is the original color of Christmas. Gold is just a recent addition to the season.